To cement the president’s message of goodwill toward China and spread some Olympic cheer, the Russian government put together a video that played over 200 times on large public screens in China, in busy places like the Beijing railway station, during the run-up to the Olympics. The 10-minute clip featured the speaker of Russia’s lower house of parliament Boris Gryzlov, speaker of the upper house Sergey Mironov, Deputy Prime Minister of the Government Alexander Zhukov, Russian star athletes Alina Kabaeva and Svetlana Khorkina, and the pop singer Alsou. If Gryzlov’s music video “Russia, ahead! It’s now your turn!” is any indication of administrative talent, then this video was destined from the start to turn a few million heads in the land of the dragon. 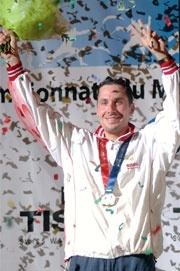 Korobov, known for his outstanding work ethic, won the European junior title in 2001. However, Russia did not select him to participate in the 2004 Olympic Games, instead sending Gaydarbek Gaydarbekov, who brought home gold. But diplomacy aside, the Olympics is about winning, and nothing boosts a country’s self- and global esteem like a few dozen shiny gold medals. Thirty or so gold medals, to be more exact. First vice-president of the Russian Olympic Committee Vladimir Vasin made it clear in as early as April that Russia intends to win 30 to 40 gold medals. Zhukov, who also heads the Sochi 2014 supervisory board, was even more optimistic. In January, he expressed that Russian athletes could bring back from Beijing 38 to 40 gold medals. To make it happen, the Russian government spent 12.180 billion rubles on preparing Russian athletes for Beijing. And it’s not just the Russian government that wants to see Russia take home more medals; Russian oligarchs joined forces to contribute to their country’s winning image. Ten of Russia’s richest tycoons, including Chelsea owner Roman Abramovich and Vagit Alekperov, the owner of Russia’s second-largest oil producer Lukoil, pledged $12 million for bonuses for Russian champions in Beijing. Russia’s richest established a fund to boost the country’s performance in the Olympics and world championships back in 2005. 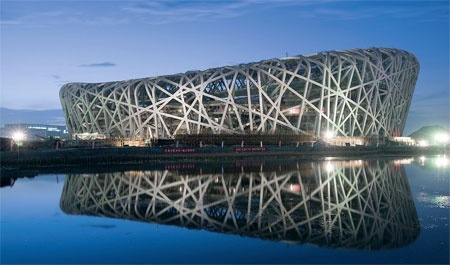 But the amount that they are spending on Russian victory in the Beijing Games exceeds that of the 2006 Turin Olympics nearly threefold. Tischenko began training at 8 with his father, Victor, and won his first tournament championship at 12, competing in the 26 kg (58 lbs.) category. Having drawn the attention of talent scouts, at 16 he entered the Omsk School and Olympic Training Center. The Russian government already awards gold, silver, and bronze medalists $50,000, $20,000, and $10,000, respectively. This is about how much U.S. athletes get. But, it’s no secret that American star athletes usually rake it in with big endorsement deals, sponsor bonuses, and high professional salaries. The tycoons’ generous positive reinforcement of Russia’s best will no doubt help to level off the playing field, so to speak, and, consequently, heat up the competition. So, who are the athletes that are guaranteed to “bring it home”? Kirilenko’s birthplace of Izhevsk is where the Soviet AK-47 assault rifle was designed and produced. 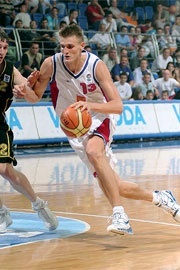 As a result, Kirilenko’s nickname is “A K-47,” a reference to his initials and his uniform number with the Utah Jazz. Russia’s women’s national handball team has a remarkable world championship record. Between 2001 and 2007, it won first place 4 times out of 5 (taking second place in 2006). The women’s volleyball team has also won the world championship on multiple occasions. Judging by its record, the women’s basketball team is also a good bet. Back in February, Russia’s VTB Bank put its money on the team by signing an agreement with the Russian Basketball Federation to become general sponsor of the women’s national team. Lev Savin, assistant deputy chief of mission, emphasized the intense competition that goes on in Russia in the run-up to the Olympics. Some athletes who have been past champions did not make this year’s cut. For example, Buvaisar Saitiev, who has won eight world-level gold medals in freestyle wrestling, did not make it into the Beijing Olympic Games. Both Savin and Kazikov identified the United States and China as Russia’s biggest competitors. Savin named American swimmer Michael Phelps and, in general, U.S. track and field, basketball, women’s soccer, and gymnastics as Russia’s major rivals. Badminton, table tennis, and diving are the “traditional” fields in which Russians and Chinese are expected to clash, Savin said. The Chernobyl nuclear accident in 1986 compelled Sharapova’s parents to move from Gomel, Belarus, to the Siberian city of Nyagan. In 2007, Sharapova was appointed a Goodwill Ambassador for the United Nations Development Program and donated $100,000 to UNDP Chernobyl-recovery projects. Savin predicted the Russian star athletes that will shine this summer. 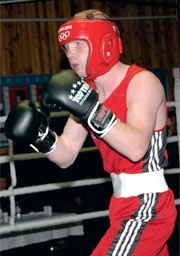 In the boxing ring, Savin advises to watch for Matvey Korobov. At 5 feet 9 inches, the twenty-fiveyear-old native of Orotukan, a city in northastern Russia, Korobov made the headlines when he won the middleweight world title in 2005 and 2007. In 2005, he defeated the famous Emilio Correa; in 2007, he beat Alfonso Blanco by an astonishing score of PTS 29:4. Korobov was not chosen to participate in the 2004 Olympics — Russia sent Gaydarbek Gaydarbekov instead. But, in Beijing, Korobov will no doubt go for the gold. After winning his first world championship at age 24, Pozdnyakov told an interviewer that he would like to establish his own fencing school in Siberia. In 2007, the Stanislav Pozdnyakov Fencing Training Center opened and now has over 200 pupils enrolled. Another Russian boxer to watch for, according to Savin, is the 24-year-old Olympic champion Alexey Tischenko, who won the up to 57 kg weight category at the Athens Games. Tischenko’s mother, Marina, describes her son as a “golden boy.” “I gave birth to him in the morning. When he was shown to me, the sun was shining from the window onto his red hair. A golden boy was born, the nurses told me,” she recalls. “I think this guy [Alexey Tischenko] has a big future,” predicted world boxing champion Vitaly Klichko, according to Tischenko’s official website. Beijing will show if he is right. The European, world, and Olympic champion and 20-time world record holder in women’s pole vault Yelena Isinbaeva is another Russian athlete guaranteed to stand out. “We will try to raise the flag of our country as frequently as possible!” Isinbaeva promised at a grand ceremony of transfer of the banner of the Russian Olympic team. For basketball fans, Andrei Kirilenko is the Russian to look for, Savin said. Anastasia and her partner train for 4 1/2 hours, have lunch, and then train for another 3 1/2 hours. The list of Russians with a chance to medal in Beijing further includes saber fencer Stanislav Pozdnyakov as well as the team of Anastasia Yermakova and Anastasia Davydova, two-time world champions in synchronized swimming. And, of course, there’s tennis player Maria Sharapova, ranked No. 3 in the world at the time of this writing. Sharapova, who likes to “make every shot a power shot,” is Russia’s best bet for a medal in tennis this year. The list of Russians with a chance to medal in Beijing further includes saber fencer Stanislav Pozdnyakov as well as the team of Anastasia Yermakova and Anastasia Davydova, two-time world champions in synchronized swimming. Also watch for pole vaulter Yelena Isinbayeva, who won a gold medal four years ago in Athens and is hoping to repeat her performance this year. Of course, there’s tennis player Maria Sharapova, ranked No. 3 in the world at the time of this writing. Sharapova, who likes to “make every shot a power shot,” is Russia’s best bet for a medal in tennis this year, though the women’s tennis team is frontloaded with a number of strong players, including Svetlana Kuznetsova, the recently added Dinara Safina, and Yelena Dementieva. Another female athlete to keep an eye on is weightlifter Oxana Slivenko. The firstever two-time female world champion from Russia, Slivenko is hoping to win a gold in Beijing. If she does, she’ll be the first female Russian weightlifter to do so. Back on the basketball court, Andrei Kirilenko will be joined by Alexander Kaun, who plays NCAA basketball for the University of Kansas, and J.R. Holden, the American CSKA forward who is a naturalized Russian citizen (see article). Like Holden, South Dakota-raised WNBA star Becky Hammon, who plays for CSKA Moscow in the WNBA off-season, will also be competing for Russia.